Yes, I looove time management games. Time Management games are games in which you perform a series of tasks or processes as quickly as possible e.g. 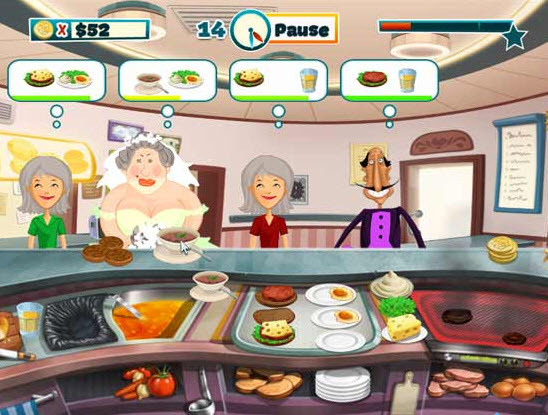 manage/cook/serve at a restaurant, stock/run a supermarket, babysit, manage a hotel, build/decorate houses. When I finish a TMG I love, I Google trying to find more like it. Also, when I say 'finish', I mean get the gold/expert score on every single level! Forgot I had played this game AGES ago. Played it again (and clocked it) over the last few days. It was just as fun (and sometimes, as frustrating haha) the second time around. I like that there is a huge variety in the meals you prepare. You start with hamburgers and hot-dogs, and through your dedication and hard work, you manage to create the best known restaurant in the country! Cook more than 100 different dishes, ranging from hot-dogs to sophisticated seafood meals. Decorate your restaurants, buy new furniture and accessories, develop expert culinary skills, upgrade your kitchen and become a happy chef! 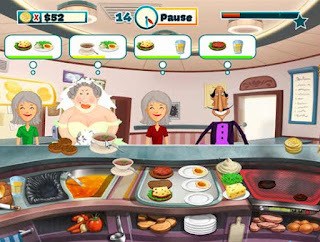 - Decorate your restaurant, Upgrade your menu. Here is a list of all the Time Management Games I have played/reviewed, or, click the blogger tag below to load all the posts on Time Management Games!